42 year old female 5'7" weighing 220 pounds developed laxity and loose skin around her abdomen, flanks, hips, thighs and back after losing 230 pounds through a gastric bypass and diet improvement. 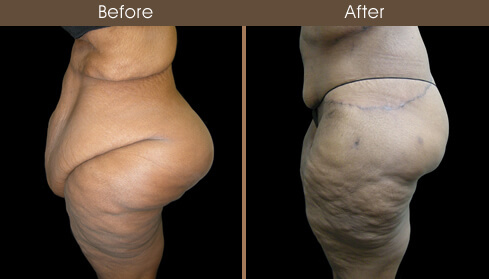 She developed a large abdominal pannus that restricted activity and created hygiene issues. She underwent a lower body lift, circumferential thigh liposuction, flank and back liposuction and an upper back lift with improved body shape. These procedures were performed in a staged fashion. Over 50 pounds of excess skin were removed during these procedures. The first stage involved an abdominoplasty (tummy tuck) and liposuction. The second stage included the posterior body lift combined with flank back, and thigh liposuction. The third stage consisted of the upper back lift.